3 minutes tuning and setting up. 10 minutes exercises and etudes. 5 minutes for a duet. 12 minutes for the solo piece. 20 minutes exercises and etudes. 17 minutes for the solo piece. 5 minutes for a duet or duet book. 7 minutes for a short piece. 25 minutes for the solo piece. 30 minutes exercises and etudes. 10 minutes for one or more duets. 15 minutes for a short piece. 32 minutes for the solo piece. -Write in a regular-sized spiral notebook as the lesson progresses. List each book and the pages to work on. -Write specific corrections in the music and general corrections (form, bad habits) at the top of the notebook page. -Write the date on small (1.5-in. x 2-in.) sticky notes and put them at the top of the assigned pages to help younger students find them. A great source for inexpensive sticky notes is Bulk Office Supply. -Use the same small sticky notes to mark cuts in music or highlight what to work on (especially in orchestra music; put a sticky note at the edge of every page with a part that needs practice). ​-Use removable highlighter tape to mark specific corrections in the music that students need help remembering. 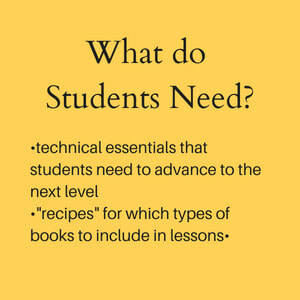 Next Step: What Do Cello Students Need? Essential skills needed to reach the next level.